Sometimes, it seems that Prius has been around forever. Indeed, this iconic model was unveiled in 1997, which these nineteen years are like a thousand in the automobile terms because with all new models, updates, and innovations. Since the first hybrid Prius has been developed, the model has been through three generational changes, the latest of which was unveiled seven years ago. Back in the 1990s and early 2000s, Toyota did not have such fierce competition in the hybrid segment it is facing right now, so the updates were introduced with relatively slow speed. However, as other manufacturers began to design their own hybrid vehicles, Toyota was also quick in the development of new elements. It better do so because Prius still remains the most popular model that is anticipated by lots of fans. One of the latest members of the Prius family, V, remains a special one because it is the largest and most capacious model. It features a somewhat unusual design of the exterior, which is much boxier and taller than the others and gained more weight. This new design has both advantages and disadvantages but the overall impression from the change is good. Even though the body of the vehicle may seem an overly boxy, it cannot be considered as an SUV because of the ground clearance of a car. It is not a truck, either, because the automaker does not provide AWD option. What is clearly a recognizable trait of any Prius is the fuel efficiency. In V, it is measured at an impressive 42 mpg combined, which should be respected given the fact that it is a five-person car with a decent storage room. 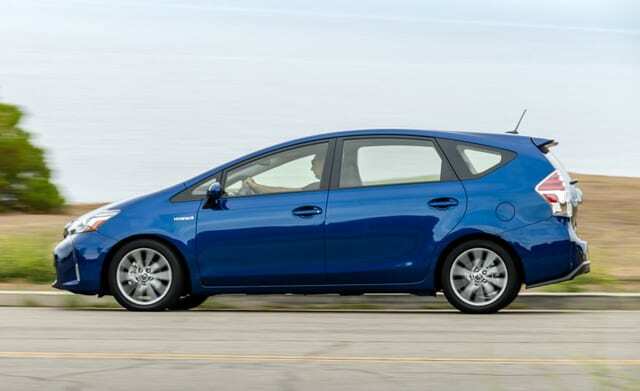 This year’s Prius V comes with a number of redesigned elements throughout the exterior. For example, the front end has become a little bit more aggressive than the previous generation thanks to new headlights and edgier appearance. The taillights have also been changed to follow the new styling language. The interior of the vehicle has been impressive as well. All the seats are really comfortable, so the occupants will be satisfied with them even after a long journey. 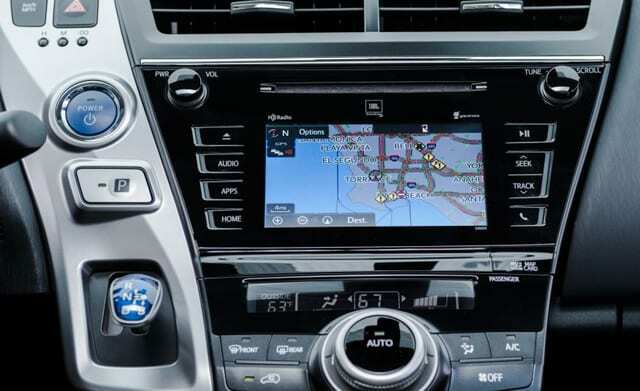 At the center of the good-looking dash is a 6.1-inch color infotainment screen with vivid colors and crisp graphics, which is not the only one because the vehicle also has a 4.2-inch information unit. It is also apparent that the seats are placed higher than in the classic Prius and they are made from high-quality materials, just like the rest of the cabin’s elements. During the long trips, the passengers will be entertained by the Entune cloud-based multimedia system. Everything here says that this is the perfect car for families because there is a decent space for storing the luggage of all family members during these long trips. Specifically, the rear load space provides between 34 to 40 cubic feet of volume, which is more than enough for the task. In addition to the boxy design of the body, the additional space for luggage is provided by the sliding rear seats. According to Toyota’s officials, the automaker is very proud to have increased the volume of the cargo space in Prius because it now provides more luggage opportunities than a number of modern small SUVs. Moreover, the cabin provides some great comfort features, like armrest and cup holders. They will also come in handy for both short and long trips. 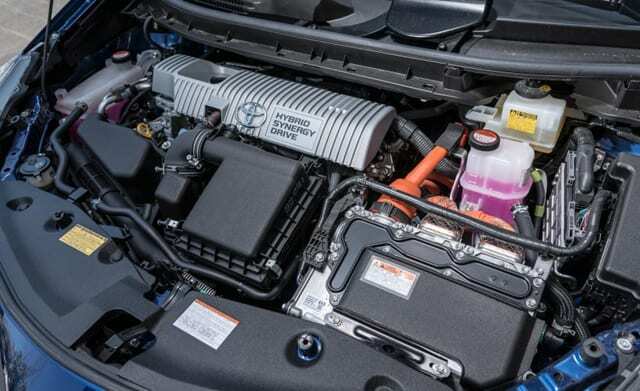 Even though it may sound a little bit disappointing for some, the automaker had decided to use the traditional Prius Liftback engine installed on the previous generation. This is a 1.8-liter unit that is capable of producing 98 hp, which is added by two electric motors. The drives of the vehicle have already shown that the increased weight of the body took its toll on the engine, which struggled a little bit on steep hills when loaded with four passengers and their luggage. The engine works in three familiar modes in additional to the basic hybrid one. As it was mentioned above, the fuel economy in this vehicle is great and estimated 42 mpg combined. As always, it is possible to drive the vehicle in all-electric mode but it will be very difficult to achieve some meaningful speeds on the highway. Similarly, the Eco mode is also very slow to drive in while the Power mode provides a reasonable boost that allows to keep up with the fast-moving city traffic. The decision to use the same engine is indeed a really bit disappointing because of slow driving modes. Given that the weight of the vehicle was increased, it would have been a good idea to install a more powerful engine that would not feel the weight of the luggage on steep hills. In this regard, Prius V remains one of the leaders because the vehicle has received the highest rating from the Insurance Institute for Highway Safety. Specifically, all the testing results were “Good,” even on the newly developed headlight test that was failed by most of the vehicles this year. 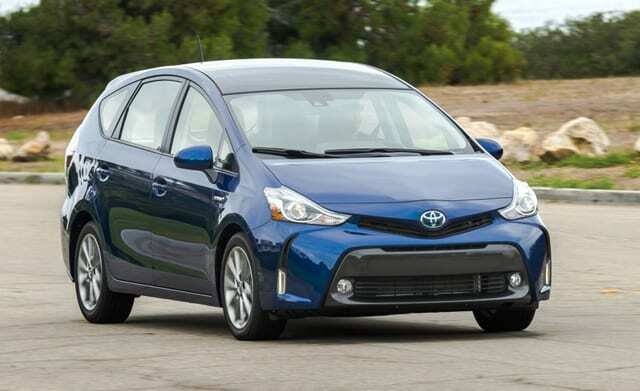 At this point, the IIHS is the only U.S. body that tested the redesigned Prius, but we think it is safe to assume that the vehicle will perform well, as always. The reason why we are so confident is the high number of safety features included in the vehicle, including a rearview camera, lane departure warning, lane keeping assist, automatic high beams, pre-collision system and adaptive cruise control. There are four trims designed by the automaker, including Two, Three, Four, and Five. They cost $24,830, $26,120, $27,640, and $28,790 respectively without the destination charges and additional packages. There are lots of options for customers to choose from, including the Advanced Technology package that provides an impressive selection of features, such as panoramic moon roof, HD navigation system, and some advanced safety functions. The automaker also makes a nice gesture for every customer of the vehicle by providing them with a one free year of the Safety Connect package that ensures emergency help.